When Scott Norton and Mark Ramadan were undergraduates at Brown University in Rhode Island a decade ago, they were horrified not by the 2008 financial crisis but by Heinz tomato ketchup. The bright red sauce was so common in shops and kitchens round the world that it seemed it would be there forever. “At the centre of supermarkets were all these classic American brands that hadn’t evolved in 70 years,” recalls Mr Norton. As they talked to their student friends, they realised that none of them wanted bland, mass market products shipped from factories by huge corporations. So they started to mix their own organic ketchup in an off-campus apartment. On graduation, they founded a company and, having no origin story with resonance, invented a joke one. They named it after a mythical Victorian called Sir Kensington, a monocled adventurer who had “advised the British East India company in the acquisition of spices”. The pair are now 31, at the heart of a millennial generation that has come of age, transforming business not only in the US but round the world. In April, their company was acquired by Unilever, the British-Dutch group that had fended off a takeover by Kraft Heinz. Their ketchup, once a student jape, has just gone on shelves in Walmart and Target. “Sir Kensington’s is the playbook for reaching millennials,” says Richard Hartell, president of strategy and transformation at Publicis Media. This is the millennial moment, long expected and feared by companies that built their brands for baby boomers. They are ageing and their offspring, once called the “echo boom”, are no longer teenagers, or even students. Pew Research Center, the US research group, defines millennials as the 73m Americans aged between 22 and 37, who will next year overtake boomers in number. “We don’t think of them as special or different any more. They are the core of our business,” says Alan Jope, president of beauty and personal care at Unilever. The coming of age of the world’s 2bn millennials is not only a generational shift: it is one of ethnicity and nationality. Forty three per cent of US millennials are non-white, and millennials in Asia vastly outnumber those in Europe and the US. Despite China’s former one-child policy, it has 400m millennials, more than five times the US figure (and more than the entire US population) while Morgan Stanley estimates that India’s 410m millennials will spend $330bn annually by 2020. This reflects the depth to which technology is integrated into millennials’ lives and habits. The oldest were teenagers at the time of the Netscape initial public offering in 1995, as the internet became a mass medium, and the youngest were 11 when the Apple iPhone was launched in 2007. They are used not only to communicating online but buying most things there: $25bn was spent on Alibaba’s Singles Day online shopping festival in China on November 11. Big companies have scrambled to adjust to millennial tastes. “Local, original, and what they can feel and trust are all good. Maybe there is a bit of a reaction to globalisation,” says Laurent Freixe, who heads Nestlé’s US and Americas business, “Organic, natural, and non-GMO are crystallising in the US very fast.” Nestlé last year bought the Blue Bottle chain of coffee shops and in May signed a $7.1bn licensing deal with Starbucks to refresh its Nescafé and Nespresso brands. But it is placing immense strain on institutions that once thrived on mass marketing of products through television advertising. Growth has slowed and investors are unhappy. “They are only about global brands, one size fits all. That was great in the ’80s and ’90s but the world has changed. Millennials want these little brands, local brands,” Nelson Peltz, the 75-year-old activist investor, said last year as he attacked Procter & Gamble. Some are being outflanked by young rivals with roots in internet and mobile. Google and Facebook have shaken marketing groups such as Publicis and WPP, and the streaming service Netflix last month overtook Walt Disney as the world’s most valuable entertainment company. Often, revenues are simply nibbled away by upstarts: Boston Consulting Group estimates that between 2011 and 2016, large US consumer groups lost $22bn in sales to smaller brands. Ella Kieran, head of WPP’s Stream conferences for its clients, is the epitome of the high-flying young global executive. At 31-years-old, she and her entrepreneur husband have a one-year-old daughter, and she divides her time between London and New York. But the couple are still renting and she worries about her generation’s future. In the US and Europe, many millennials are disenchanted with their lot as they attain maturity. A UK Resolution Foundation study found that pessimists outweighed optimists by two to one when they were asked about their chances of improving on their parents’ fortunes. They are highly educated: 39 per cent of British 25 to 39-year-olds are graduates, compared with 23 per cent of those between 55 and 64. But their sophistication and ambition is not matched by security. This is largely an accident of history. Older millennials entered the workforce in the mid-2000s, and many lost jobs after the 2008 crisis. They were also caught by rapid inflation in house prices as interest rates fell and remained low. The milestones of leaving home, getting a job, marrying and having children have been delayed — 45 per cent of 18 to 34-year-old Americans had done all four in 1975, but only 24 per cent had in 2015. It has spawned widespread distrust, both in organisations and individuals. A Pew study in 2014 found that only 19 per cent of millennials believed that others could be trusted, compared with 40 per cent of boomers and 31 per cent of the generation Xers born between 1965 and 1980. Millennial faith in institutions is also low. “This generation is incredibly sceptical of governments and big corporations,” says Keith Niedermeier, professor at the Wharton business school. The pattern of preferring smaller, independent brands and outlets extends to media consumption. Technology and social media have unleashed an extraordinary fragmentation in how they absorb information. In the US, they watch 19 hours a week of broadcast and cable television, compared with the average adult’s 34 hours, according to Nielsen. Radio stations have lower reach among millennials but 37 per cent of them listen to at least one podcast a week. New companies can reach millennials via social media, which further encourages fragmentation. Beauty is a prime example. Revenues of smaller brands grew 16 per cent a year between 2008 and 2016, according to the consultancy McKinsey. Millennials will often experiment with edgier brands such as Urban Decay, which was acquired by L’Oréal in 2012. Make-up artists, including Charlotte Tilbury and Trish McEvoy, have attracted large followings. Technology has not eliminated a millennial desire for community experience. Shared workspaces are expanding — the co-working company WeWork was valued at $20bn last year — members’ clubs such as Soho House are growing and festivals have proliferated. Live music alone had global revenues of $26bn in 2016, according to PwC. “I laugh about the terms community and experience, but they are exactly what we provide,” says Nick Jones, founder of Soho House. Asia’s millennials, the biggest generation of all, share many attributes with those in the west, but not their insecurity. They are confident of living better lives than their parents, particularly in China, where baby boomers lived through Maoism and the cultural revolution of the late 1960s and 1970s. Even in south-east Asian “tiger” economies that achieved rapid growth, families often saved all that they could. It is having a profound effect on global patterns of consumption, with more to come. Emerging and developing economies are home to 86 per cent of millennials, and the World Bank estimates that Chinese millennials’ income will overtake that in the US by 2035. The luxury industry has tilted towards Asia, where prestige brands are seen as guarantees of quality. A third of Chinese millennials said in one survey that they were very likely to buy a Swiss watch. Like others, the luxury industry is having to adjust to what these consumers want. It was once tightly controlled, with seasonal fashion shows to unveil designs that were then pushed through stores. Now, social media influencers such as Chiara Ferragni, an Italian fashion maven with 13m Instagram followers, set the trends and the pace has quickened. “They need more regular product, more drops, something new on Instagram,” says Helen Brand, UBS European luxury analyst. The surprise is the degree to which Asia’s luxury consumers have been joined by a segment of millennials in the west. “A few years ago, millennials were seen as young people who could not afford luxury,” says Ms Brand. The bank estimates that they account for 50 per cent of Gucci’s sales and 65 per cent of Yves Saint Laurent’s. It is a taste of millennials’ buying power — their collective annual income will exceed $4tn by 2030, according to the World Bank. This also reflects the divide in fortunes among millennials in the US and Europe, not just between high and low earners but between those born to asset-rich baby boomers and those lacking familial wealth. Accenture estimates there will be a transfer of at least $30tn in wealth from US baby boomers to millennials during the next three decades. The move has started with parental loans to young adults to buy homes, and will continue through death and inheritance. Here is the voice of a generation that now wields greater power than even some of its members realise. The companies that cannot meet their demands are in trouble. Financial disaster is quickly forgotten. There can be few fields of human endeavor in which history counts for so little as in the world of finance. In one, consumers work for employers to produce products and services. The employees are paid wages and salaries, and business owners earn profits. They use much of that income to purchase the goods and services produced by the economy. They save the remainder. A certain portion of the output represents "investment" goods, which are not consumed, and the portion of income not used for consumption - what we call "saving" - is used to directly or indirectly purchase those investment goods. There may be some goods that are produced and are not purchased, in which case they become unintended "inventory investment," but in a general sense, this first economic system is a well-functioning illustration of what we call "circular flow" or "general equilibrium." As is always the case in the end, income equals expenditure, savings equal investment, and output is absorbed either as consumption or investment. The second economic system is dysfunctional. Consumers work for employers to produce goods and services, but because of past labor market slack, weak bargaining power, and other factors, they are paid meaningfully less than they actually need to meet their consumption plans. The government also runs massive deficits, partly to supplement the income and medical needs of the public, partly to purchase goods and services from corporations, and partly to directly benefit corporations by cutting taxes on profits (despite being the only country in the OECD where corporations pay no value-added tax). Meanwhile, lopsided corporate profits generate a great deal of saving for individuals at high incomes, who use these savings to finance government and household deficits through loans. This creation of new debt is required so the economy's output can actually be absorbed. Businesses also use much of their profits to repurchase their own shares, and engage in what amounts, in aggregate, to a massive debt-for-equity swap with public shareholders: through a series of transactions, corporations issue debt to buy back their shares, and investors use the proceeds from selling those shares, directly or indirectly, but by necessity in equilibrium, to purchase the newly issued corporate debt. The first of these economic systems is self-sustaining: income from productive activity is used to purchase the output of that productive activity in a circular flow. Debt is used primarily as a means to intermediate the savings of individuals to others who use it to finance productive investment. The second of these economic systems is effectively a Ponzi scheme: the operation of the economy relies on the constant creation of low-grade debt in order to finance consumption and income shortfalls among some members of the economy, using the massive surpluses earned by other members of the economy. Notably, since securities are assets to the holder and liabilities to the issuer, the growing mountain of debt does not represent "wealth" in aggregate. Rather, securities are the evidence of claims and obligations between different individuals in society, created each time funds are intermediated. So it's not just debt burdens that expand. Debt ownership also expands, and the debt deteriorates toward progressively lower quality. The dysfunctional economic system provides the illusion of prosperity for some segments of the economy. But in the end, the underlying instability will, as always, be expressed in the form of mass defaults, which effectively re-align the enormous volume of debt with the ability to service those obligations over the long-term. This is where we find ourselves, once again. If you examine financial history, you'll see how this basic narrative has unfolded time and time again, and is repeated largely because of what Galbraith called "the extreme brevity of the financial memory." Debt-financed prosperity is typically abetted by central banks that encourage consumers and speculators to borrow (the demand side of Ponzi finance) and also encourage yield-seeking demand among investors for newly-issued debt securities that offer a "pickup" in yield (the supply side of Ponzi finance). The heavy issuance of low-grade debt, and the progressive deterioration in credit quality, ultimately combine to produce a debt crisis, and losses follow that wipe out an enormous amount of accumulated saving and securities value. The strains on the income distribution are partially relieved by borrowers defaulting on their obligations, and bondholders receiving less than they expected. The hallmark of an economic Ponzi scheme is that the operation of the economy relies on the constant creation of low-grade debt in order to finance consumption and income shortfalls among some members of the economy, using the massive surpluses earned by other members of the economy. Recall how this dynamic played out during the mortgage bubble and the collapse that followed. After the 2000-2002 recession, the Federal Reserve lowered short-term interest rates to 1%, and investors began seeking out securities that would offer them a "pickup" in yield over safe Treasury securities. They found that alternative in mortgage debt, which up to that time had never encountered a crisis, and was considered to be of the highest investment grade. In response to that yield-seeking demand, Wall Street responded by creating more "product" in the form of mortgage securities. To keep yields relatively high, mortgage loans were made to borrowers of lower and lower credit quality, eventually resulting in interest-only, no-doc, and sub-prime loans. The illusory prosperity of rising prices created the impression that the underlying loans were safe, which extended the speculation, and worsened the subsequent crisis. The current speculative episode has recapitulated many of these features, but it's tempting to imagine that this time is different. It's not obvious why this belief persists. Certainly, the equity market valuations we observed at the recent highs weren't wholly unprecedented - on the most reliable measures, the market reached nearly identical valuations at the 1929 and 2000 pre-crash extremes. Likewise, the extreme speculation in low-grade debt securities is not unprecedented. We saw the same behavior at the peak of the housing bubble in 2006-2007. The duration of this advancing half-cycle has been quite extended, of course, but so was the advance from 1990-2000 and from 1921 to 1929. My sense is that part of what makes present risks so easy to dismiss is that observers familiar with financial history saw the seeds of yet another emerging bubble years ago, yet the bubble unfolded anyway. Nobody learned anything from the global financial crisis. Indeed, the protections enacted after the crisis are presently being dismantled. Extreme "overvalued, overbought, overbullish" market conditions - which closely preceded the 1987, 2000-2002, and 2007-2009 collapses (and contributed to my own success in market cycles prior to 2009) emerged years ago, encouraging my own early and incorrect warnings about impending risk. Our reliance on those syndromes left us crying wolf for quite some time. In response, many investors have concluded that all apparent risks can be dismissed. This conclusion will likely prove to be fatal, because it implicitly assumes that if one measure proves unreliable (specifically, those "overvalued, overbought, overbullish" syndromes), then no measure is reliable. 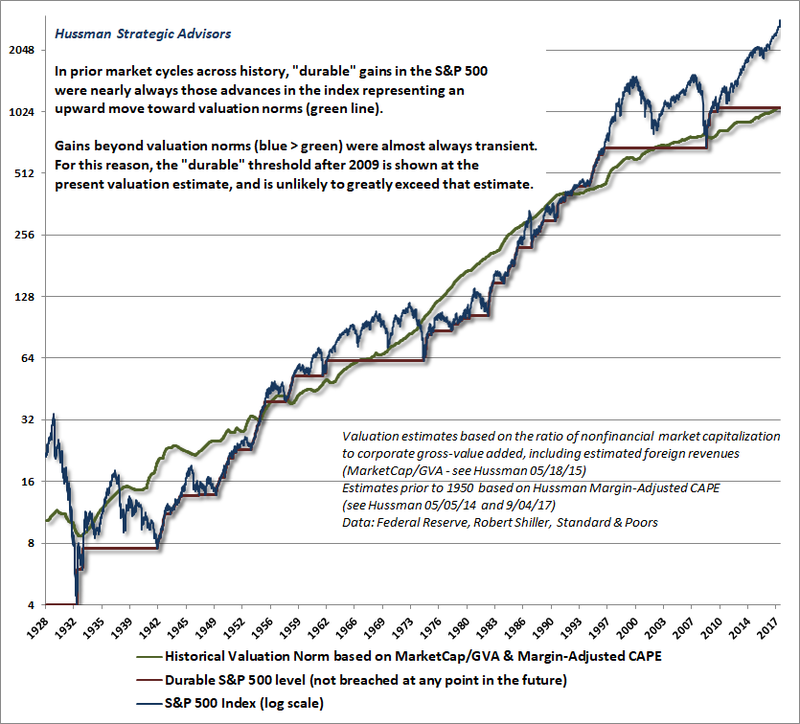 Yet aside from the difficulty with those overextended syndromes, other measures (specifically, the combination of valuations and market internals) would have not only captured the bubble advances of recent decades, but would have also anticipated and navigated the subsequent collapses of 2000-2002 and 2007-2009. I expect the same to be true of the collapse that will likely complete the current cycle. One should remember that my own reputation on that front was rather spectacular in complete market cycles prior to the recent speculative half-cycle. So it's essential to understand exactly what has been different in the period since 2009, and how we've adapted. Emphatically, historically reliable valuation measures have not become any less useful. Valuations provide enormous information about long-term (10-12 year) returns and potential downside risk over the completion of a given market cycle, but they are often completely useless over shorter segments of the cycle. There is nothing new in this. Likewise, the uniformity or divergence of market action across a wide range of securities, sectors, industries, and security-types provides enormously useful information about the inclination of investors toward speculation or risk-aversion. Indeed, the entire total return of the S&P 500 over the past decade has occurred in periods where our measures of market internals have been favorable. In contrast, the S&P 500 has lost value, on average, in periods when market internals have been unfavorable, with an interim loss during those periods deeper than -50%. Internals are vastly more useful, in my view, than simple trend-following measures such as 200-day moving averages. There is nothing new in this. The speculative episode of recent years differed from past cycles only in one feature. In prior market cycles across history, there was always a point when enough was enough. Specifically, extreme syndromes of "overvalued, overbought, overbullish" market action were regularly followed, in short order, by air-pockets, panics, or outright collapses. In the face of the Federal Reserve's zero interest rate experiment, investors continued to speculate well after those extremes repeatedly emerged. This half-cycle was different in that there was no definable limit to the speculation of investors. One had to wait until market internals deteriorated explicitly, indicating a shift in investor psychology from speculation to risk-aversion, before adopting a negative market outlook. Understand that point, or nearly two thirds of your paper wealth in stocks, by our estimates, will likely be wiped out over the completion of this market cycle. One of the outcomes of stress-testing our market risk/return classification methods against Depression-era data in 2009 (after a market collapse that we fully anticipated) was that the resulting methods prioritized "overvalued, overbought, overbullish" features of market action ahead of the condition of market internals. In prior market cycles across history, those syndromes typically emerged just before, or hand-in-hand with deterioration in market internals. Quantitative easing and zero-interest rate policy disrupted that overlap. It was detrimental, in recent years, to adopt a negative market outlook in response to extreme "overvalued, overbought, overbullish" features of market action, as one could have successfully done in prior market cycles across history. That was our Achilles Heel in the face of Fed-induced yield-seeking speculation. Once interest rates hit zero, there was simply no such thing as "too extreme." Indeed, as long as one imagined that there was any limit at all to speculation, no incremental adaptation was enough. For our part, we finally threw our hands up late last year and imposed the requirement that market internals must deteriorate explicitly in order to adopt a negative outlook. No exceptions. The lesson to be learned from quantitative easing, zero-interest rate policy, and the bubble advance of recent years is simple: one must accept that there is no limit at all to the myopic speculation and self-interested amnesia of Wall Street. Bubbles and crashes will repeat again and again, and nothing will be learned from them. However, that does not mean abandoning the information from valuations or market internals. It means refraining from a negative market outlook, even amid extreme valuations and reckless speculation, until dispersion and divergences emerge in market internals (signaling a shift in investor psychology from speculation to risk-aversion). A neutral outlook is fine if conditions are sufficiently overextended, but defer a negative market outlook until market internals deteriorate. Learn that lesson with us, and you'll be better prepared not only to navigate future bubbles, but also to avoid being lulled into complacency when the combination of extreme valuations and deteriorating market internals opens up a trap door to subsequent collapse. This half-cycle was different in that there was no definable limit to the speculation of investors. One had to wait until market internals deteriorated explicitly, indicating a shift in investor psychology from speculation to risk-aversion, before adopting a negative market outlook. Prioritizing market internals ahead of "overvalued, overbought, overbullish" syndromes addresses the difficulty we encountered in this cycle, yet also preserves the considerations that effectively allowed us to anticipate the 2000-2002 and 2007-2009 collapses. "The information contained in earnings, balance sheets and economic releases is only a fraction of what is known by others. The action of prices and trading volume reveals other important information that traders are willing to back with real money. This is why trend uniformity is so crucial to our Market Climate approach. Historically, when trend uniformity has been positive, stocks have generally ignored overvaluation, no matter how extreme. When the market loses that uniformity, valuations often matter suddenly and with a vengeance. This is a lesson best learned before a crash than after one. Valuations, trend uniformity, and yield pressures are now uniformly unfavorable, and the market faces extreme risk in this environment." "Remember, valuation often has little impact on short-term returns (though the impact can be quite violent once internal market action deteriorates, indicating that investors are becoming averse to risk). Still, valuations have an enormous impact on long-term returns, particularly at the horizon of 7 years and beyond. The recent market advance should do nothing to undermine the confidence that investors have in historically reliable, theoretically sound, carefully constructed measures of market valuation. Indeed, there is no evidence that historically reliable valuation measures have lost their validity. Though the stock market has maintained relatively high multiples since the late-1990's, those multiples have thus far been associated with poor extended returns. 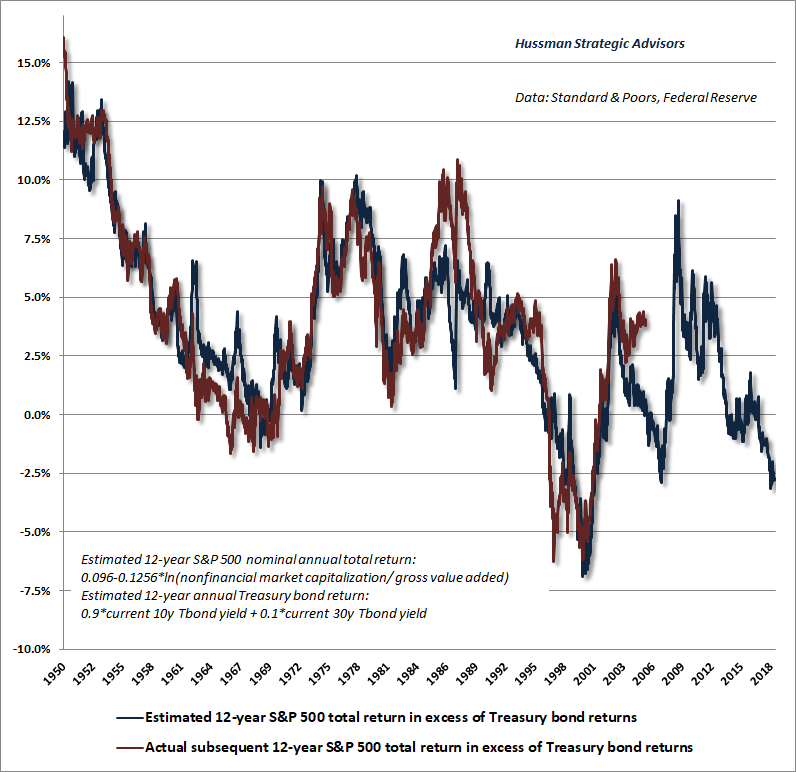 Specifically, based on the most recent, reasonably long-term period available, the S&P 500 has (predictably) lagged Treasury bills for not just seven years, but now more than eight-and-a-half years. Investors will place themselves in quite a bit of danger if they believe that the 'echo bubble' from the 2002 lows is some sort of new era for valuations." It's very easy to forget that by the 2009 low, investors in the S&P 500 had lost nearly 50%, including dividends, over the preceding 9 years, and had underperformed Treasury bills for nearly 14 years. Yet on the valuation measures we find best correlated with actual subsequent S&P 500 total returns, recent valuation extremes rival or exceed those of 1929 and 2000. The lesson to be learned from quantitative easing, zero-interest rate policy, and the bubble advance of recent years is simple: one must accept that there is no limit at all to the myopic speculation and self-interested amnesia of Wall Street. Bubbles and crashes will repeat again and again, and nothing will be learned from them. However, that does not mean abandoning the information from valuations or market internals. It means refraining from a negative market outlook, even amid extreme valuations and reckless speculation, until dispersion and divergences emerge in market internals. A neutral outlook is fine if conditions are sufficiently overextended, but defer a negative market outlook until market internals deteriorate. At present, our measures of market internals remain unfavorable, as they have been since the week of February 2, and our most reliable measures of valuation remain at offensive extremes. If market internals improve, we'll immediately adopt a neutral outlook (or possibly even constructive with a strong safety net). Here and now, however, we remain alert that there is an open trap door, in a market that I fully to expect to reach 1100 or lower on the S&P 500 over the completion of this cycle, and to post negative total returns over the coming 12-year horizon. Remember how market cycles work. There is a durable component to gains, and a transitory component. The durable component is generally represented by gains that take the market up toward reliable historical valuation norms (the green line on the chart below). The transitory component is generally represented by gains that take the market beyond those norms. Based on the measures we find most reliable across history, we presently estimate the threshold between durable and transient to be roughly the 1100 level on the S&P 500, a threshold that we expect to advance by only about 4% annually in the years ahead. Most bear market declines breach those valuation norms, and the ones that don't (1966, 2002) see those norms breached in a subsequent cycle. We have no expectation that the completion of the current market cycle will be different. Let's return to the concept of a dysfunctional economy, where consumption is largely financed by accumulating debt liabilities to supplement inadequate wages and salaries, where government runs massive fiscal deficits, not only to support the income shortfalls of its citizens, but increasingly to serve and enhance corporate profits themselves, and where corporations enjoy lopsided profits with which they further leverage the economy by engaging in a massive swap of equity with debt. This setup would be an interesting theoretical study in risk and disequilibrium were it not for the fact that this is actually the situation that presently exists in the U.S. economy. The chart below shows wages and salaries as a share of GDP. This share reached a record low in late-2011, at the same point that U.S. corporate profits peaked as a share of GDP. That extreme was initially followed by a rebound, but the share has slipped again in the past couple of years. With the unemployment rate falling to just 3.8% in the May report, inflation in weekly average earnings has pushed up to 3%, and is likely to outpace general price inflation in the coming quarters. Meanwhile, amid the optimism of a 3.8% unemployment rate (matching the rate observed at the 2000 market peak), investors appear to ignore the implication that this has for economic growth. The fact is that nearly half of the economic growth we've observed in the U.S. economy in this recovery has been driven by a reduction in the unemployment rate. 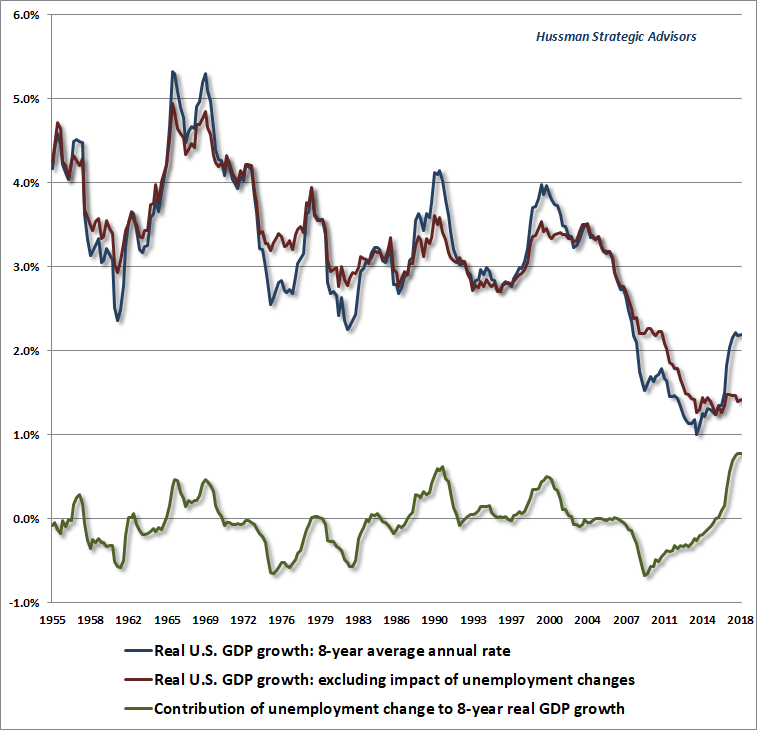 The red line below shows how the underlying "structural" growth rate of the U.S. economy has slowed in recent decades. Based on population and demographic factors, even if the unemployment rate remains at 3.8% in 2024, employment growth will contribute just 0.6% annually to GDP growth, leaving productivity growth (averaging well below 1% annually in the recovery since 2010) to contribute the balance. Without the cyclical contribution of a falling unemployment rate, real U.S. economic growth is likely to slow to well-below 2% annually, and even that assumes the economy will avoid a recession in the years ahead. 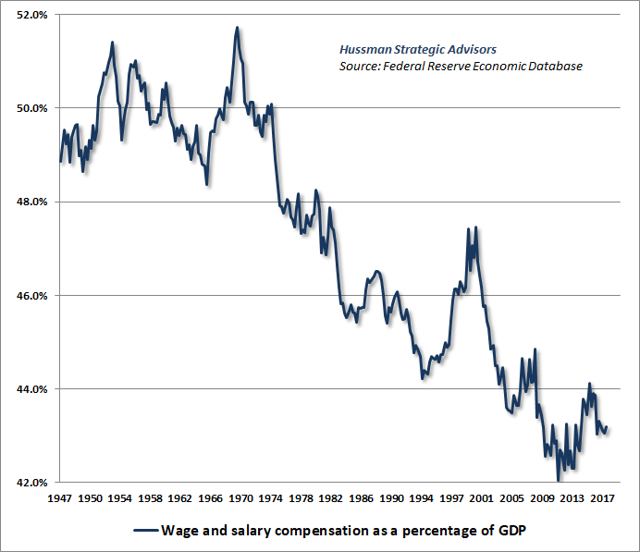 Wage inflation has been quite limited in the aftermath of job losses during the global financial crisis. Given a tightening labor market, an acceleration of wage gains will be good news for employees, but the delay has contributed to quite a few distortions in the interim. One clear distortion is that profit margins have been higher and more resilient in this cycle than in prior economic cycles. Again, this elevation of profit margins is a mirror image of slack labor markets and weak growth in wages and salaries. The relationship isn't perfect, as a result of quarter-to-quarter volatility, but the inverse relationship between the two is clear. A good way to understand the relationship between wages and profits is to think in terms of unit labor costs. Consider a generic unit of output. The revenue of generic output is measured by the economy-wide GDP price deflator. The cost of employment embedded into that output is measured by unit labor cost (ULC). 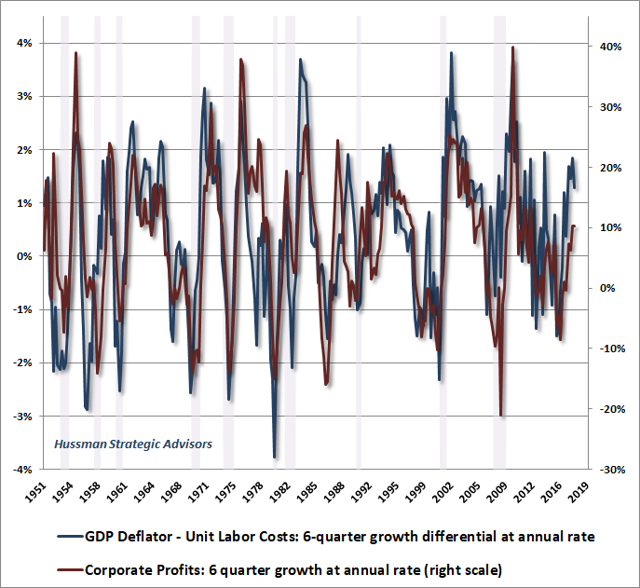 Accordingly, we would expect profit margins to increase when unit labor costs rise slower than the GDP deflator, and we would expect profit margins to fall when unit labor costs rise faster than the GDP deflator. That's exactly what we observe in the data. The same relationship can be observed in the way that profits increase and decrease over the economic cycle. Now remember how we talked about the "circular flow" of the economy? One consequence of equilibrium, which has to hold even in a dysfunctional economy, is that income is equal to expenditure (remember, we're including investment, and even unintended inventory accumulation), and savings are equal to investment. When U.S. corporate profits are unusually high, it's typically an indication that households and the government are cutting their savings and going into debt. In an open economy like ours, we can measure not only savings by households and the government, but also the amount of savings that foreigners send to the economy by purchasing securities from us. As it happens, that "inflow" of foreign savings is the mirror image of our current account deficit, because if we don't pay for our imports by sending foreigners goods and services, it turns out that we pay for them by sending them securities. Because the "balance of payments" always sums to zero, whenever we export securities to foreigners, on balance, we also run a trade deficit. Since real investment in factories, capital goods, and housing has to be financed by savings, you'll also find that our trade deficit regularly "deteriorates" during U.S. investment booms, and "improves" during recessions. 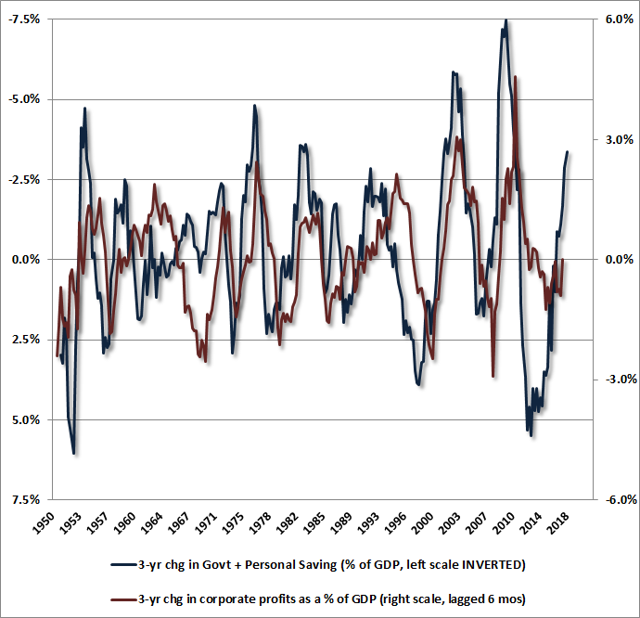 So here's an interesting way to think about corporate profits: since gross domestic investment has to be financed by total savings (household, government, foreign, corporate), and because fluctuations in gross domestic investment are largely financed by fluctuations in foreign capital inflows, we would expect corporate profits to be high when the sum of household and government savings is low. Put simply, when U.S. corporate profits are unusually high, it's typically an indication that households and the government are cutting their savings and going into debt. Combine this with the fact that corporate profits move inversely to wage and salary income, and it should be evident that the surface prosperity of the U.S. economy masks a Ponzi dynamic underneath. 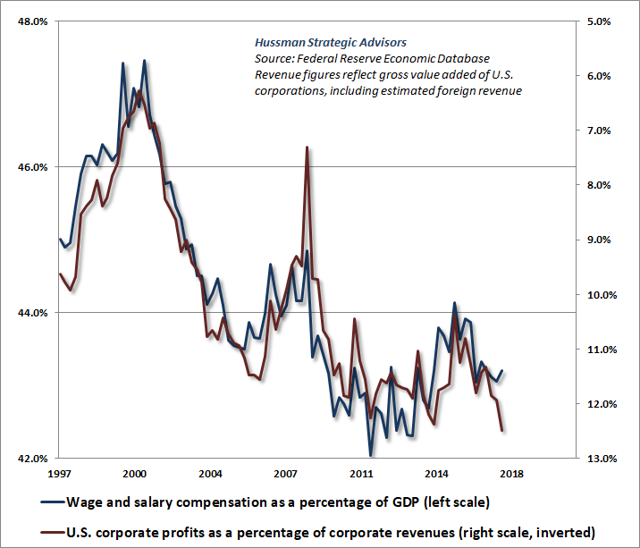 Specifically, corporations are highly profitable precisely because wage and salary growth was deeply depressed by the labor market slack that followed the global financial crisis. In the interim, households have bridged the gap by going increasingly into debt, while government deficits have also increased, both to provide income (and health care) support, and to benefit corporations directly. 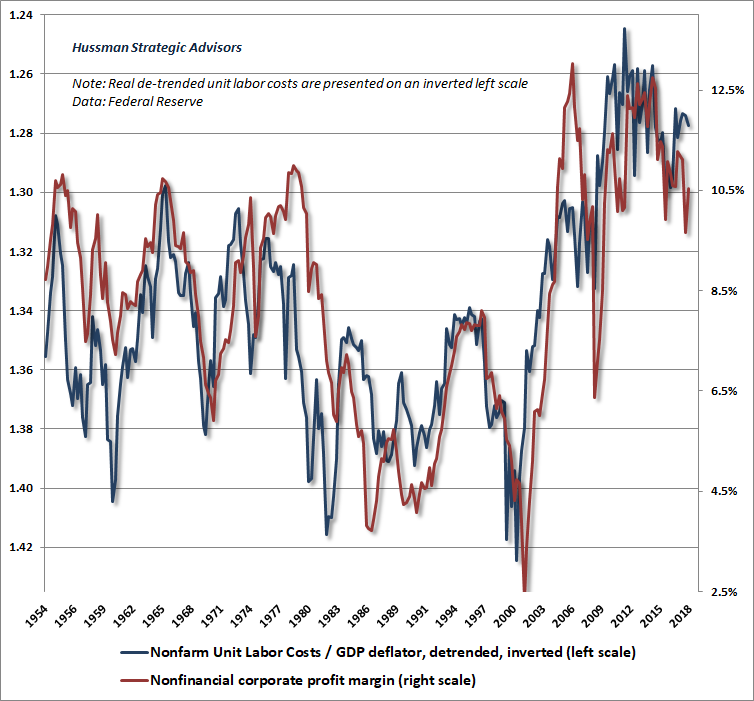 Record corporate profits are essentially the upside-down, mirror image of a dysfunctional economy going into extreme indebtedness. 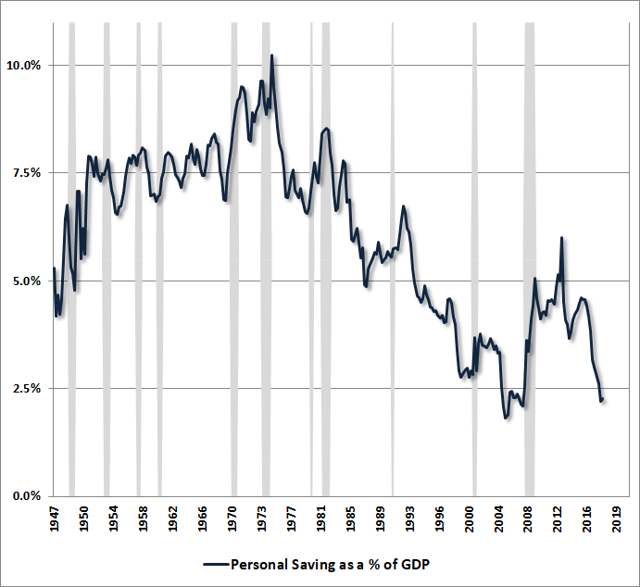 The chart below shows personal saving as a share of GDP. At present, saving is at the lowest level since the "equity extraction" bonanza that accompanied the housing bubble. Only in this instance, the low rate of saving largely reflects depressed incomes rather than extravagant consumption. In a Ponzi economy, the gap between income and consumption has to be bridged by increasing levels of debt. The chart below illustrates this dynamic. Total federal public debt now stands at 106% of GDP, and about 77% of GDP if one excludes the Social Security trust fund and other intragovernmental debt. Both figures are the highest in history. 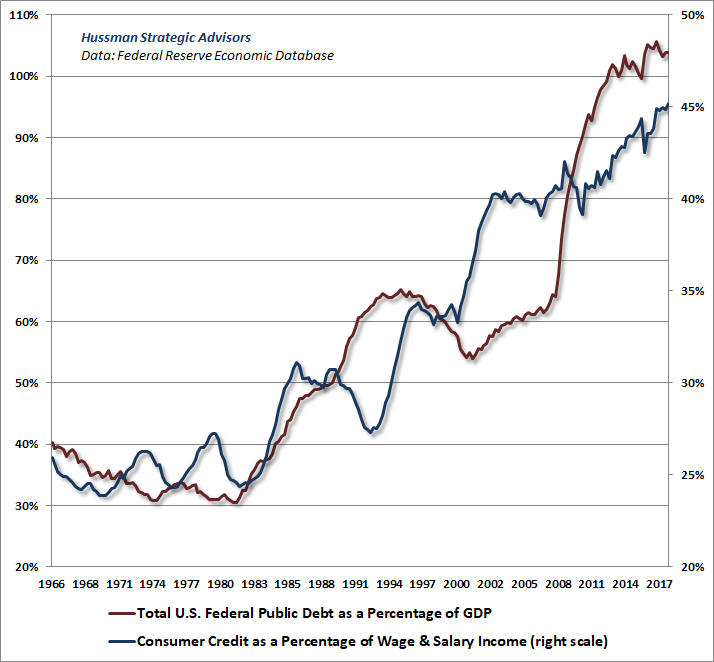 Not surprisingly, consumer credit as a share of wage and salary income has also pushed to the highest level in history. To put the U.S. federal debt into perspective, only 12 countries have higher ratios of gross government debt to GDP, the largest being Japan, Greece, Italy, and Singapore. The only reason we aren't as vulnerable to credit strains as say, Italy or Greece, is that those peripheral European countries do not have their own independent central banks and therefore have no "printing press" to backstop their promises. Rather, the European Central Bank can only buy the debt of individual member countries in proportion to their size, unless those countries submit to full austerity plans. That's why we continue to monitor European banks, many which carry the same level of gross leverage today as U.S. banks prior to the global financial crisis. The most leveraged among them is Deutsche Bank (NYSE:DB), which plunged to a record low last week, and is particularly worth watching. Despite record profits, high debt issuance has also infected corporate balance sheets, as companies lever themselves up by repurchasing their own shares. 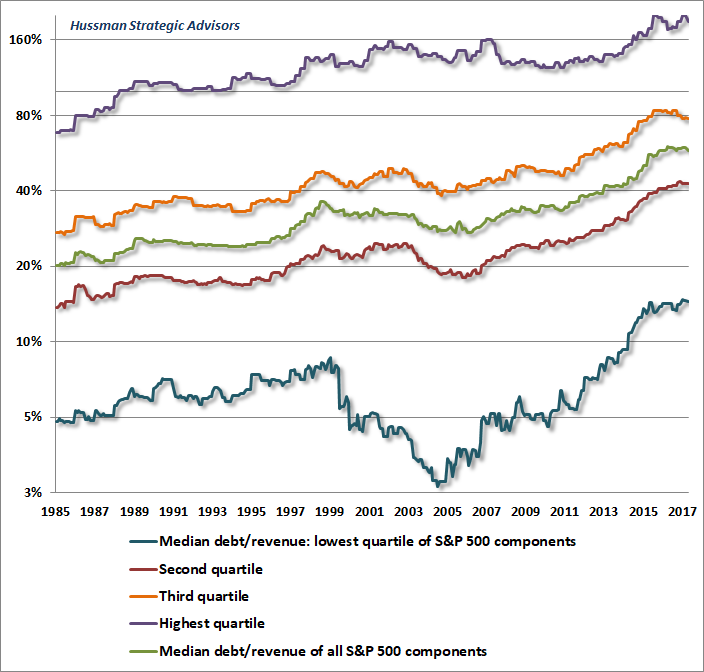 The chart below shows median ratio of debt to revenue among S&P 500 components, as well as the median ratios sorted by quartile. The chart is presented on log scale, with each division showing a doubling in debt/revenue (thanks to our resident math guru Russell Jackson for compiling this data). In recent years, corporate debt has advanced to the highest fraction of revenues in history, nearly tripling from 1985 levels across every quartile. Moody's observed last week that since 2009, the number of global nonfinancial companies rated as speculative or junk has surged by 58%, to the highest proportion in history. Despite the low rate of defaults at present, Moody's warns that future periods of economic stress will cause a "particularly large" wave of defaults (h/t Lisa Abramowicz, Jeff Cox). The expansion of junk and near-junk credit has again extended to commercial mortgage bonds, where interest-only loans now account for over 75% of the underlying debt. Bloomberg notes that "as investors have flocked to debt investments that seem safe, underwriters have been emboldened to make the instruments riskier and keep yields relatively high by removing or watering down protections." Similar deterioration is evident in the $1 trillion market for leveraged loans (loans to already heavily indebted borrowers), where "covenant lite" loans, which offer fewer protections to lenders in the event of default, now account for 77% of loans. Leveraged loans are catching up to the U.S. high-yield market, which accounts for another $1.2 trillion in debt. 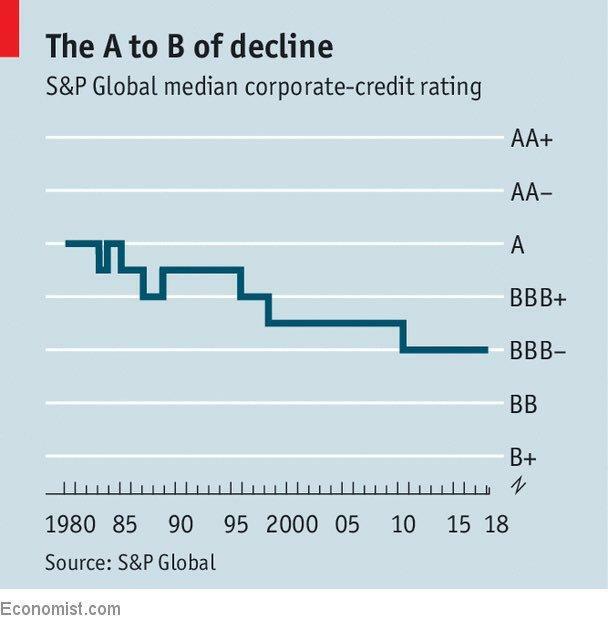 Meanwhile, the median corporate credit rating has dropped to BBB- according to S&P Global. That's just one notch above high yield, speculative-grade junk. Oaktree Capital (where Howard Marks is Co-Chair), told Bloomberg last week that it expects "a flood of troubled credits topping $1 trillion. The supply of low quality debt is significantly higher than prior periods, while the lack of covenant protections makes investing in shaky creditors riskier than ever. Those flows could mean debt will fall into distress quickly." The bottom line is that the combination of wildly experimental monetary policy and subdued growth in wages and salaries in the recovery from the global financial crisis has contributed to a dysfunctional equilibrium, with massive increases in debt burdens at the government, household, and corporate level. The quality of this debt has progressively weakened, both because of lighter covenants and underwriting standards, and because of a more general deterioration in credit ratings and servicing capacity. Low household savings and growing consumer debt, born of depressed wage and salary compensation, have contributed to temporarily elevated profit margins that investors have treated as permanent. Corporations, enticed by low interest rates, have engaged in a massive leveraged buy-out of stocks, partly to offset dilution from stock grants to executives, and apparently in the misguided belief that valuations and subsequent market returns are unrelated. Equity valuations, on the most reliable measures, rival or exceed those observed at the 1929 and 2000 market extremes. By our estimates, stocks are likely to substantially underperform Treasury bond yields in the coming 10-12 years. Emphatically, valuation extremes cannot be "justified" by low interest rates, because when interest rates are low because growth rates are also low, no valuation premium is "justified" at all. Amid these risks, I'll emphasize again that our immediate, near-term outlook would become much more neutral (or even constructive with a strong safety net) if an improvement in market internals was to indicate fresh speculative psychology among investors. Still, further speculation would only make the completion of this cycle even worse. The hallmark of an economic Ponzi scheme is that the operation of the economy relies on the constant creation of low-grade debt in order to finance consumption and income shortfalls among some members of the economy, using the massive surpluses earned by other members of the economy. The debt burdens, speculation, and skewed valuations most responsible for today's lopsided prosperity are exactly the seeds from which the next crisis will spring. NEW YORK – The currency scare that Argentina suffered last month caught many by surprise. In fact, a set of risky bets that Argentina’s government undertook starting in December 2015 increased the country’s vulnerability. What was not clear was when Argentina’s economy would be put to the test. When the test came, Argentina failed. Argentina had to address a number of macroeconomic imbalances when President Mauricio Macri took office at the end of 2015. Early measures included the removal of exchange-rate and capital controls and the reduction of taxes on commodity exports. Argentina also recovered access to international credit markets following a settlement with so-called vulture funds over a debt dispute that had lasted more than a decade. The government undertook a new macroeconomic approach based on two pillars: gradual reduction of the primary fiscal deficit, and an ambitious inflation-targeting regime that was supposed to bring annual price growth down to a single-digit rate in just three years. Markets cheered. The prevailing view, eagerly promoted by Argentina’s government, was that the country had done what was necessary to achieve sustainably faster economic growth. Presumably, foreign direct investment would flow in. But it did not. Instead, Argentina suffered stagflation in 2016, followed by a debt-based recovery in 2017. That led to a surge in imports that was not accompanied by a proportional increase in exports, widening the current-account deficit to 4.6% of GDP and sowing doubt about the virtues of the new approach. Then, a few weeks ago, markets stopped cheering, expectations soured, and capital fled. The peso depreciated 19% against the US dollar in just the first three weeks of May. Contrary to Macri’s hopes, his reforms attracted mainly short-term portfolio capital and financing in the form of bonds, both in foreign and domestic currency, rather than foreign direct investment. Argentina’s central bank bears a significant share of the responsibility; while its approach proved largely ineffective in reducing inflation to the target level (the annual rate is still at about 25%), high interest rates encouraged inflows of speculative capital, which worsened the external imbalances and heightened Argentina’s vulnerability to external shocks. As part of their inflation-targeting approach, the central bank has been sterilizing a large share of the increases in the monetary base through the sale of central banks bonds (LEBACS). This means that the public sector has been effectively financing through short-run central bank debt issuance the largest part of the sizable primary fiscal deficit (4.2% and 3.83% of GDP in 2016 and 2017, respectively). The issuance of LEBCAS has been massive, soaring by 345% since December 2015. This might have been sustainable had early expectations of Argentina’s prospects been validated. There were obviously trade-offs. Less aggressive sterilization would have contained the growth in central bank debt that has now proven to be so risky, and it would have prevented upward pressure on the exchange rate; but it would have led to higher inflation. Nonetheless, attempting to reduce inflation and the fiscal deficit at similar speeds would have been a more prudent approach. After all, macroeconomic policy decisions should not be made on the basis of the most optimistic scenario when the cost of missed expectations is large. The currency crisis finally revealed Argentina’s vulnerabilities. Looking ahead, the country will be exposed to several different sources of risk. First, there is still a large stock of LEBACS. And every time a significant portion of that debt falls due, Argentina will be a hostage of financial markets’ mood. This will increase the expected exchange-rate volatility, which may create opportunities for speculative financial investments, but will discourage investments in the real economy. Second, because the public sector’s foreign-currency-denominated debt is much higher than it was two years ago, the increase in exchange-rate risk will also call into question the sustainability of public-sector debt. To assess where Argentina is heading after the crisis requires highlighting several salient elements of how the episode was managed. First, the central bank lost 10% of its total stock of foreign-exchange reserves in just a month. Second, the annual nominal interest rate on the LEBACS was raised to 40% – the highest in the world, and a move that risks creating a snowball of central-bank debt. Third, and most shocking for Argentines, Macri announced that the country would seek a stand-by agreement with the International Monetary Fund. Thus, if Argentina’s public sector falls into a state of debt distress in the coming years, it will have to submit to the tutelage of the IMF – a creditor in itself, but also an institution that is dominated by international creditors. At that point, the conditionality that the IMF typically imposes in exchange for financing could cause severe damage. Most worrisome is that the inflation-targeting approach that has exacerbated Argentina’s external imbalances has been reaffirmed. It would thus not be surprising if a new cycle of real exchange-rate appreciation starts in 2019. With a presidential election next year, that would be good news for Macri; but it would not bode well for Argentina’s future. 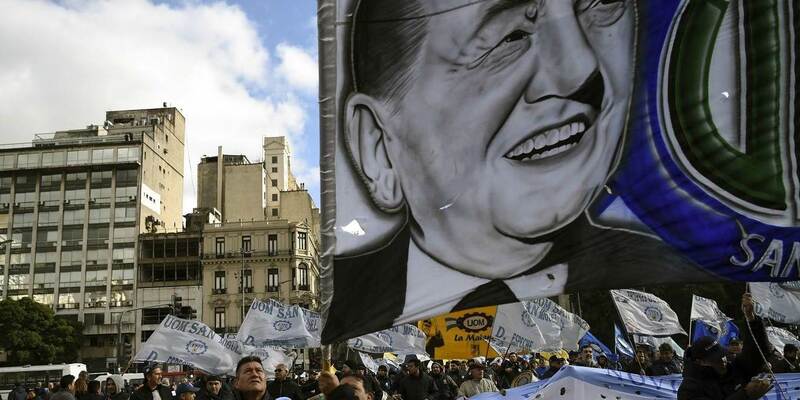 Ultimately, because Macri’s approach to putting Argentina’s economy on a sustained growth path has so far failed, and has increased the country’s dependence on international creditors, his administration still faces the challenge of avoiding a debt crisis. To protect economic activity and redress vulnerabilities, the strategy of gradually reducing the primary fiscal deficit should be maintained. But, to save Argentina from an increase in external imbalances affecting the sustainability of external public debt, monetary policy must change. That means finally recognizing that attempting to reduce inflation at a much faster rate than the fiscal deficit entails costly risks. The prudent path also requires a gradual reduction in the stock of LEBACS, recognizing that greater inflationary pressure in the short term is the price of minimizing the risk of higher external imbalances and larger exchange-rate depreciations down the road. And it would certainly be a mistake to continue reducing the tax on soybean exports, as Macri’s administration has announced it will do. Further tax cuts would increase the deficit, while benefiting a sector that already enjoys rents. A change in macroeconomic policies is not sufficient to set Argentina on a path of inclusive and sustained economic development; but it is necessary. At the outset of Macri’s administration, there were warnings that he had chosen a high-risk approach. Unfortunately, those warnings were ignored. The strategy we are recommending is not without its own risks. But we are convinced that it offers a viable and sounder path forward. Martin Guzman, a research associate at Columbia University Business School and an associate professor at the University of Buenos Aires, is a co-chair of the Columbia Initiative for Policy Dialogue Taskforce on Debt Restructuring and Sovereign Bankruptcy and a senior fellow at the Centre for International Governance Innovation (CIGI). Joseph E. Stiglitz, a Nobel laureate in economics, is University Professor at Columbia University and Chief Economist at the Roosevelt Institute. His most recent book is Globalization and Its Discontents Revisited: Anti-Globalization in the Era of Trump. On April 20, 2010, 40 miles southeast of the Louisiana coast, an offshore oil rig named Deepwater Horizon exploded into a giant fireball. It was the worst environmental disaster in US history. The blast killed 11 workers and crippled the drilling platform. The entire rig eventually sank. The explosion also caused four million barrels of oil to spill into the Gulf of Mexico. It was the world’s biggest marine oil spill—ever. Some of the mess washed ashore in Alabama, Florida, Louisiana, Mississippi, and Texas, destroying thousands of coastal businesses. The rest poisoned once-rich Gulf fisheries. It took almost two months to cap the oil well and stop the flow. By that point, the tab for the damage was over $50 billion. The negative media coverage was nonstop. It was the worst-case scenario for offshore drillers. Everyone hated them, including investors. The US offshore rig count (a convenient marker of the oil industry’s health) collapsed following the disaster. It fell 80% from April 2010 to July 2010. Today—after some additional setbacks—the industry is finally poised for its big comeback. This is partly because the Trump administration is moving to peel back offshore drilling regulations. I’ll get to those details in a moment. But first, you need to know a bit about the oil market as a whole. The oil market is highly cyclical. It goes through regular booms and busts, just like other commodity markets. Volatility can be your best friend, as long as your timing is reasonable. I don’t mean timing exact tops and bottoms—no one can do that. I mean spotting the trend and betting on it when others are not, so you can buy low to later sell high. Oil experienced a major boom cycle from 2002–2008. The price of oil skyrocketed 705% during this period. It went from $18 per barrel in 2002 to $145 in 2008. Then, oil plunged 80% as the 2008 financial crisis unfolded, down to a low of $30 per barrel. Oil went through a new boom cycle from 2009–2014. The price of oil topped out at $114 during this cycle. Then, in late 2014, the US and Saudi Arabia colluded to keep the oil market saturated. Low oil prices hurt the Russian and Iranian economies, which both depend heavily on oil sales. This created a new bust cycle. Oil plummeted 76%. Then the cycle turned again. The price of oil has been going up since it bottomed in 2016. But it still hasn’t reached its previous highs. That’s because it hasn’t had the right catalyst yet. A regional war in the Middle East—which looks increasingly likely as Iran and Israel pick away at each other—would certainly do the trick. Offshore oil production matters. It accounts for about 30% of the world’s oil supply. The US offshore drilling industry eventually stabilized as cleanup from the Deepwater Horizon accident progressed. The offshore rig count grew steadily from the end of 2010 through 2014 as the oil price rose. Then the price of oil plunged 76% during the 2014¬¬–2016 bust cycle. And the offshore rig count plunged right back down with it. The rig count started to increase again after oil bottomed in February 2016. For a moment, it looked like the offshore oil industry would recover with the price of oil. Then the rig count suddenly reversed course. It plummeted to its lowest level in over 10 years. It took six years for the federal government to react to the Deepwater Horizon crisis. Then in 2016, it significantly increased offshore drilling regulations. The Obama administration banned all new offshore oil and gas development within more than 100 million acres of the Atlantic coast. It also blocked nearly 94% of drilling on the outer continental shelf, which is the area between coastal waters and the deep ocean. This was a major problem for offshore oil drillers. You see, the offshore oil business goes through its own booms and busts, just like the oil market as a whole. In the last cycle, oil drillers brought too many rigs into the market at the wrong time. Just as the industry was finally putting the Deepwater Horizon accident behind it, the price of oil tumbled. Offshore drillers got crushed. While the price of oil and most oil stocks has been rising since 2016, the offshore oil industry has floundered. I think that’s about to change. Earlier this year, the Trump administration moved to lift Obama’s offshore drilling ban. This would allow new offshore oil and gas drilling in nearly all US coastal waters. Trump’s proposal would also free up 90% of the outer continental shelf for offshore drilling. This bodes very well for the US offshore oil industry. Offshore drilling activity, as measured by the rig count, has increased significantly over the past few months. Right now, utilization for all offshore rigs is at 74.2%. Optimal utilization is 80%. The industry isn’t there yet. But there’s been a notable improvement since 2017, when it hovered in the 70% range. This is a good sign that the offshore oil industry is starting to recover from its worst ever downturn. The sentiment about offshore drilling is increasingly positive. Investment dollars are flowing back into production capacity. It looks like 2017 marked the bottom for the offshore oil industry. Offshore oil stocks have lagged behind other oil stocks. So even a “catch-up” rally would send stock prices higher. In short, these companies are very cheap right now, and are poised for an uptrend. Couple that with the positive outlook on the price of oil, and you’re looking at an excellent crisis investing opportunity.